Junior Developers hone and advance their expertise as software engineers; the roles and responsibilities of a Junior Developer include – pairing with the other developers and assisting in software development, hunting and fixing bugs, evaluating, assessing and recommending software solutions; modeling and designing appropriate solutions for problem domains, creating and improving websites, developing back-end VoIP applications by using multi-thread technology and Java networking; designing new features, integrating new features, integrating test cases and guaranteeing software quality. Reviewed the performance issues raised by users with concurrent requests and application screens. Fine-tuned and fixed the underlying objects/programs for better performance. Resolved user issues in create and maintained PA & GL periods and month end closure period exceptions. Worked closely with some of the top customers to review their implementation setups, data corruptions and provided solutions specific to customer requirements. Product/tools: Oracle Project Accounting, Oracle, Sybase, DB2, T-SQL, UNIX, Shell scripting and DB Visualizer. Worked on projects that involve major application enhancements and upgrades. Developed over time calculation extension for processing overtime premium costs of employees in claim management system. Developed complex reports on employee claim, payment, and absence activity to internal and external clients. Automated the process to send the report in an email/ftp reports to desired recipients. Monitored the of application batches, concurrent requests, call/ticket handling and production support. Retrofitting and post-implementation support for Sybase to DB2 migration. 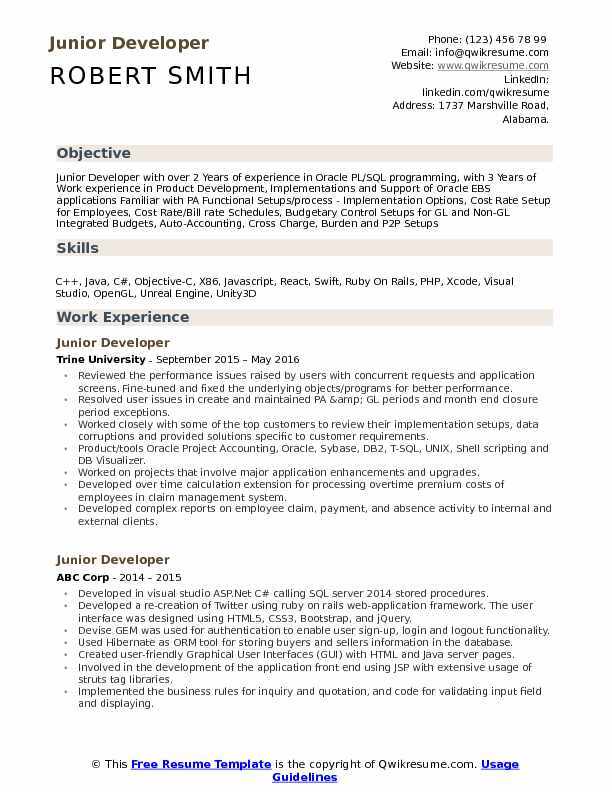 Objective : Enthusiastic focused and motivated Junior Developer with one plus years of experience is seeking an opportunity to contribute in institutions by implementing concepts, knowledge, and methodologies learn thereby adding value for the organization. Ability to apply theoretical concepts in the practical world. Excellent communication skills- both oral and written. Flexible and adaptable to demands of changing work environments. Team player and also independently responsible. Skills : .NET, Android, C++, PL/SQL, SQL, Java, SQL Server, T-SQL, Tableau, Microsoft Office, Excel, C, HTML, HTML 5, CSS, XML, Word, MySQL, CCNA, DB/Server/Network Oracle, MYSQL, SQL, HTTP, TCP/IP Programming Languages C++, C, Java, SQL, PL/SQL. Gathered requirements from the users and checked the structure of the schema and data with the data modular. Gathered business requirements, definition, and design of the data sourcing and data flows, data. Quality analysis, working in conjunction with the data warehouse architect on the development of logical data models. Installed SQL server and management tools using SQL server setup program. Expert in creating databases and various SQL server objects like schemas, tables, indexes. Indexed view as per the specifications and requirements to meet the business functionality. Experience in developing stored procedures, functions, triggers, views, cursors, packages and exceptions. Designed T-SQL scripts to identify long running queries and blocking sessions. Customized the stored procedures and database triggers to meet the changing business rules. Worked with SQL server database to store and retrieve the application data. 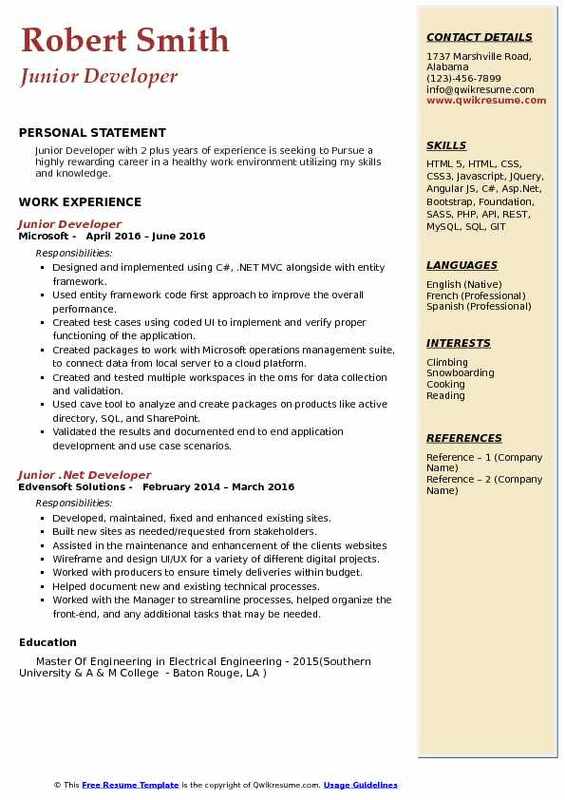 Headline : Junior Developer II with 6 plus years of experience in the Technology domain is seeking to obtain full-time employment in an engineering related field that utilizes my skills and maximizes my potential. Developing the components of an application that is deployed in a distributed environment using the Microsoft Visual Studio integrated development environment. Designing and developing the implementations of functionality targeted for hosted applications that support multi-tenant, highly scalable transaction processing. Designing MVVM patterns using Ajax jQuery to call the web services and then using the returned JSON results to bind Knockout JS model. Creating custom SharePoint farm solutions using custom features, custom content types custom lists, and event receivers. Involving in the migration of intranet, community sites from SharePoint2010 to SharePoint2013. Developing custom nintex task pages to integrate seamlessly with nintex custom workflow to automate business requirements. Designing and developing various abstract classes, interfaces, classes to construct the business logic using C#.Net. Built n-tier architecture for the presentation layer, the business and data access layers and were coded using C#.Net, developed application logic using C#. Rebuilding indexes and update statistics at regular intervals for better performance. Good experience in resolving to block and deadlocking using SQL commands. Used C#.Net and Ado.Net objects such as data adapter, data reader, dataset, and data grid for reading and displaying records from the database. Worked on DotNet framework to migrate existing ASP to ASPX as well as creating new ASPX pages. Working on business and data analysis, data profiling, data migration, data integration, and metadata. Used Ado.Net database programming to access and retrieve data from the SQL server 2012 database. Using ASP.Net, C#.Net code for the front-end to interact with business layer and data access layer. Using Ajax control toolkit extended controls for better user experience and to achieve the desired functionality. 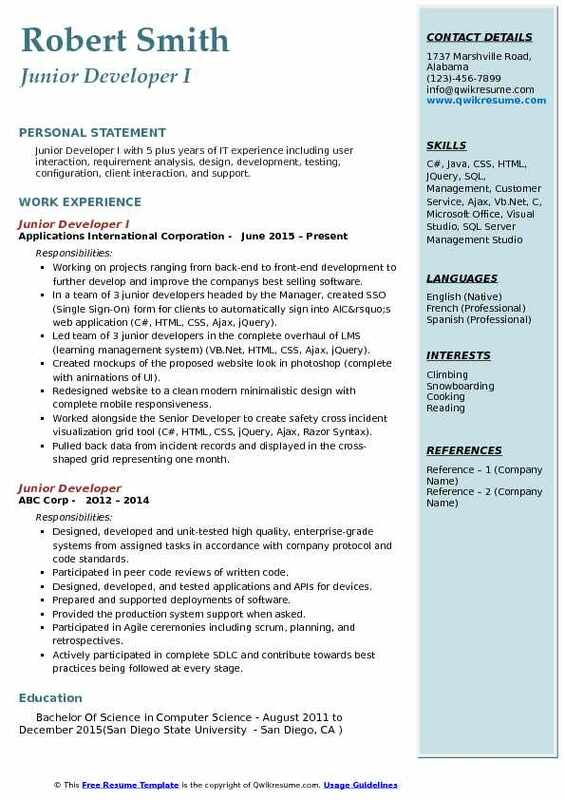 Headline : Junior Developer I with 5 plus years of IT experience including user interaction, requirement analysis, design, development, testing, configuration, client interaction, and support. Working on projects ranging from back-end to front-end development to further develop and improve the company's best selling software. In a team of 3 junior developers headed by the Manager, created SSO (Single Sign-On) form for clients to automatically sign into AIC’s web application (C#, HTML, CSS, Ajax, jQuery). 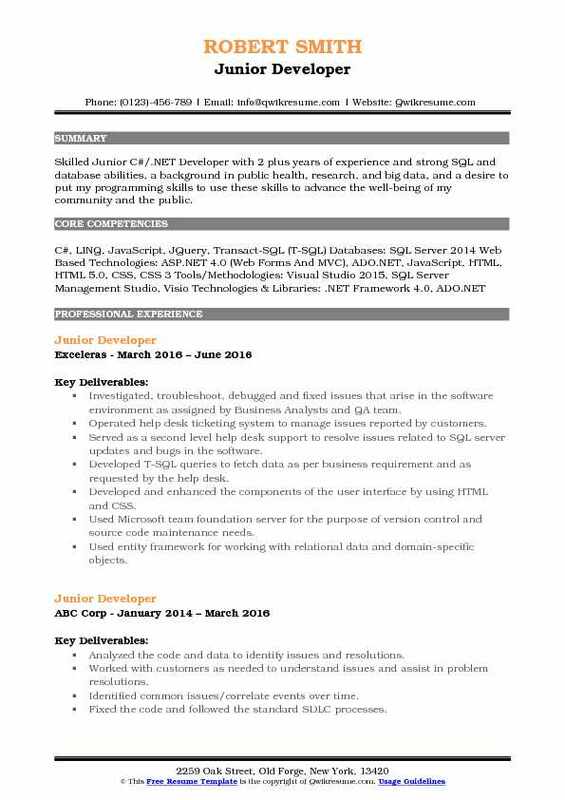 Led team of 3 junior developers in the complete overhaul of LMS (learning management system) (VB.Net, HTML, CSS, Ajax, jQuery). Created mockups of the proposed website look in photoshop (complete with animations of UI). Redesigned website to a clean modern minimalistic design with complete mobile responsiveness. Worked alongside the Senior Developer to create safety cross incident visualization grid tool (C#, HTML, CSS, jQuery, Ajax, Razor Syntax). Pulled back data from incident records and displayed in the cross-shaped grid representing one month. The single-handed effort in converting the 20-year-old IE-6-only-compatible project into the modern application. 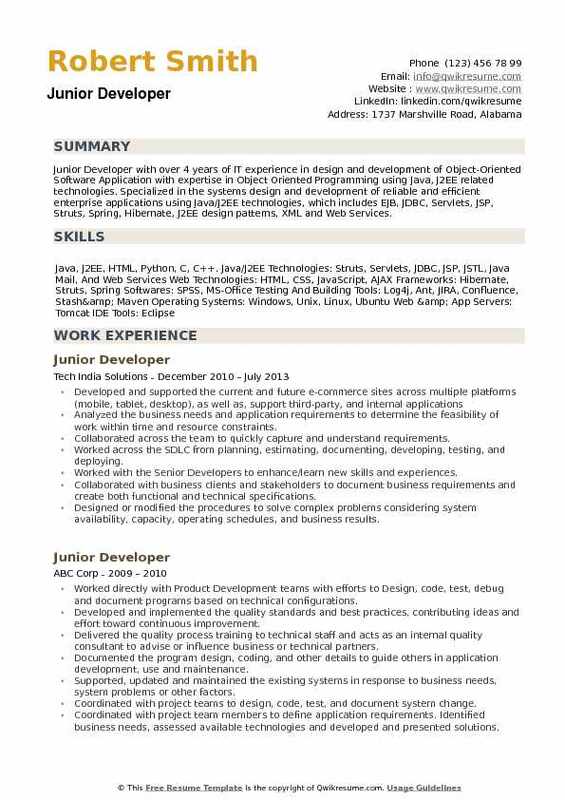 Headline : Junior Developer with 5 plus years of experience is seeking to obtain a position that brings new challenges and skill development in order to further my expertise and reward in the work field. Authoring the training materials and procedures for end-user support documentation. Collaborating with the staff, users, and management to establish requirements for the new system and reporting modifications. Troubleshooting and answering the user inquiries regarding computer software or browser operation to resolve problems. Designing and modification of new and existing reports, queries, and various outputs based on customer design and specification utilizing active reports for .NET with C# and built-in controls. User training in custom software for business solutions utilizing GoToMeeting and other webinar platforms. Consulting with customers regarding future customizations and maintenance schedules. Technical support testing for new software applications including point and click and specific functions used for financial, education, and other specialized operations. Main responsibilities included acceptance testing for initial develop feedback and to ensure design meet customer requirements and practical use. 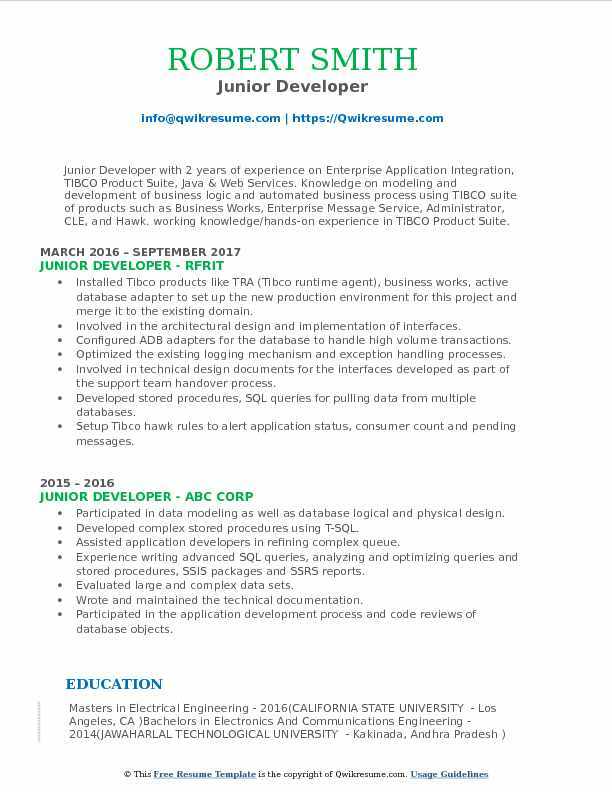 Objective : Junior Developer with 2 years of experience on Enterprise Application Integration, TIBCO Product Suite, Java & Web Services. Knowledge on modeling and development of business logic and automated business process using TIBCO suite of products such as Business Works, Enterprise Message Service, Administrator, CLE, and Hawk. working knowledge/hands-on experience in TIBCO Product Suite. Installed Tibco products like TRA (Tibco runtime agent), business works, active database adapter to set up the new production environment for this project and merge it to the existing domain. Involved in the architectural design and implementation of interfaces. Configured ADB adapters for the database to handle high volume transactions. Optimized the existing logging mechanism and exception handling processes. Involved in technical design documents for the interfaces developed as part of the support team handover process. Developed stored procedures, SQL queries for pulling data from multiple databases. Setup Tibco hawk rules to alert application status, consumer count and pending messages. 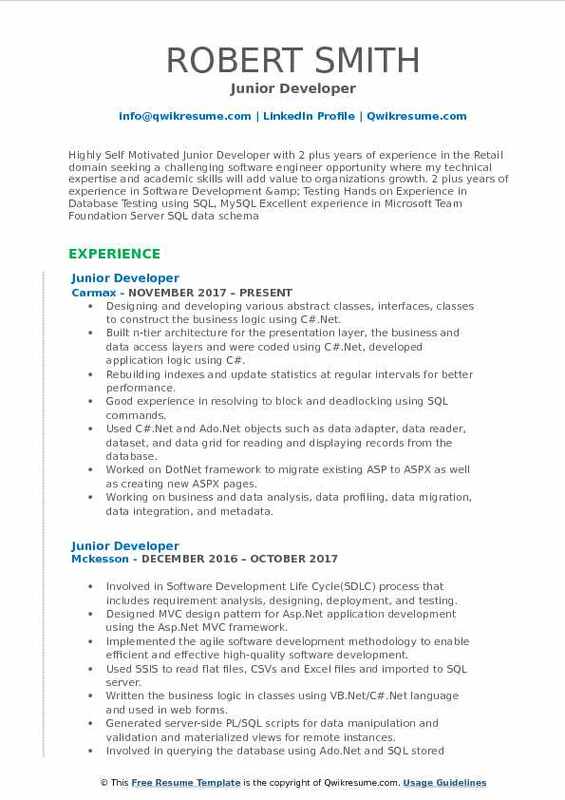 Objective : Skilled Junior C#/.NET Developer with 2 plus years of experience and strong SQL and database abilities, a background in public health, research, and big data, and a desire to put my programming skills to use these skills to advance the well-being of my community and the public. Investigated, troubleshoot, debugged and fixed issues that arise in the software environment as assigned by Business Analysts and QA team. Operated help desk ticketing system to manage issues reported by customers. 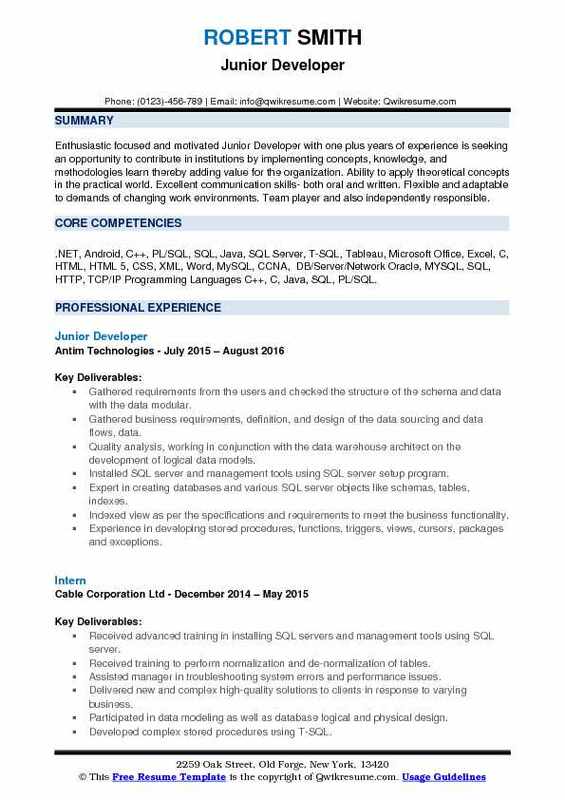 Served as a second level help desk support to resolve issues related to SQL server updates and bugs in the software. Developed T-SQL queries to fetch data as per business requirement and as requested by the help desk. Developed and enhanced the components of the user interface by using HTML and CSS. Used entity framework for working with relational data and domain-specific objects. Collaborated with the Senior Developers and Business Analysts on assigned tasks and projects detailed in functional specification documentation. Used Linq to SQL and Linq to objects to retrieve data based on requirements. 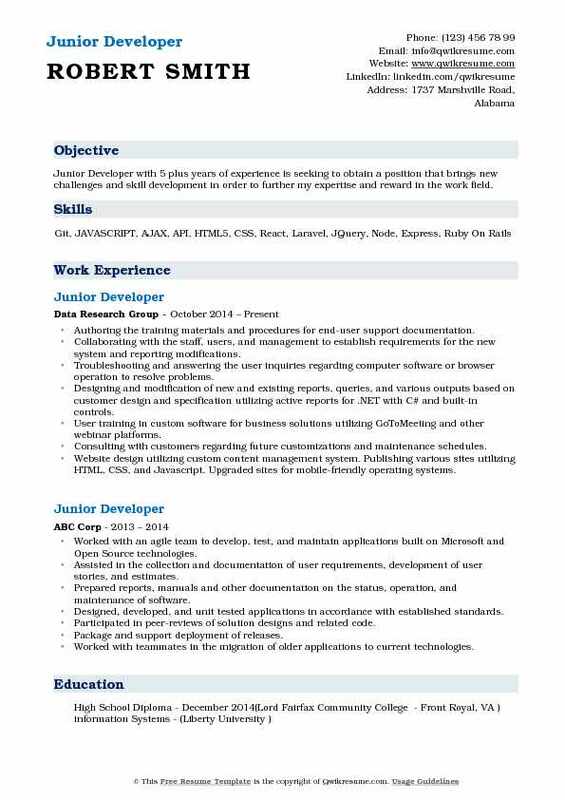 Objective : Junior Developer with 2 plus years of experience is seeking to Pursue a highly rewarding career in a healthy work environment utilizing my skills and knowledge. Designed and implemented using C#, .NET MVC alongside with entity framework. Used entity framework code first approach to improve the overall performance. Created test cases using coded UI to implement and verify proper functioning of the application. Created packages to work with Microsoft operations management suite, to connect data from local server to a cloud platform. Created and tested multiple workspaces in the oms for data collection and validation. Used cave tool to analyze and create packages on products like active directory, SQL, and SharePoint. Validated the results and documented end to end application development and use case scenarios. 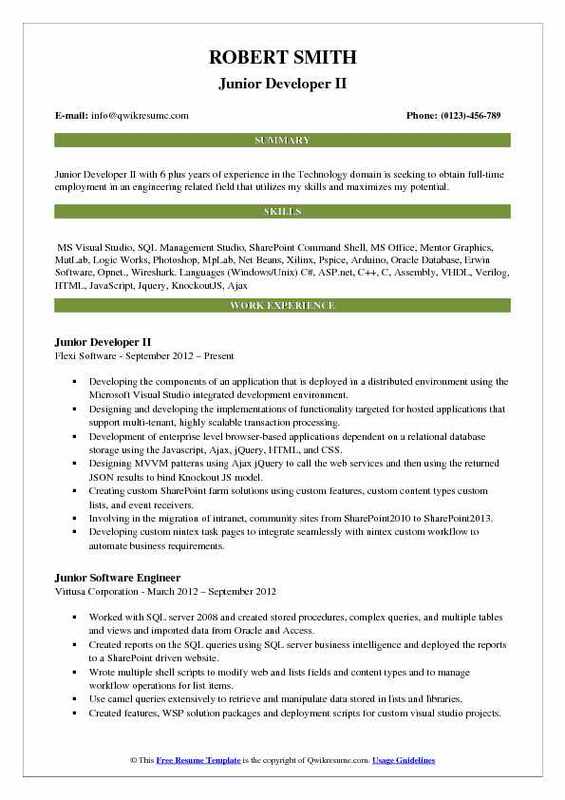 Objective : Junior Developer with over 4 years of IT experience in design and development of Object-Oriented Software Application with expertise in Object Oriented Programming using Java, J2EE related technologies. Specialized in the systems design and development of reliable and efficient enterprise applications using Java/J2EE technologies, which includes EJB, JDBC, Servlets, JSP, Struts, Spring, Hibernate, J2EE design patterns, XML and Web Services. Analyzed the business needs and application requirements to determine the feasibility of work within time and resource constraints. Collaborated across the team to quickly capture and understand requirements. Worked across the SDLC from planning, estimating, documenting, developing, testing, and deploying. Worked with the Senior Developers to enhance/learn new skills and experiences. Collaborated with business clients and stakeholders to document business requirements and create both functional and technical specifications. Designed or modified the procedures to solve complex problems considering system availability, capacity, operating schedules, and business results. Documented applications in support of system development life cycle compliance.